Walking through new home construction will give any buyer a good idea of the different things which can be designed in a master bathroom. After all, isn’t that one of the most popular rooms (besides the kitchen) people gravitate to in a high end home. Vanities – I’m talking of the kind my mother and grandmother used to have. A counter area set aside as a makeup/style station, with a nice cushiony seat. Art Mirrors – this is my description of the mirrors that hang above vanities, placed in largely decorated frames that usually hold expensive works of art. Heated Floors – in Minnesota, these are soooo nice during the winter! 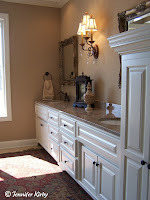 Antique Dressers – antiques are now being converted into vanities, giving the bathroom a really unique feel. Furniture styled cabinets really help elevate the bathroom up so it feels more like a part of the master bedroom, and not just the ugly stepchild of the home. Multiple Shower Heads – when I say multiple, I mean at least three, sometimes four or five. These are the showers where buyers wonder if Hugh Hefner is living there with a few playmates. Lots of Wood – bathrooms no longer have to be just tile. Floors are being constructed of bamboo, giving the room an oriental aura, and some home owners are putting reclaimed beams on the ceiling. Wood is no longer taboo in a steamy bathroom. Lots of Light – windows, windows, windows. Gone are the tiny windows that no one could see out of, as well as the glass blocks of the 1980’s. Who cares if the neighbors can see in…they are envious after all, right? 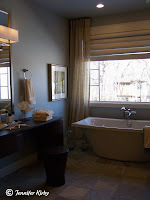 If you really want to get a good idea of luxury trends in bathrooms around Minneapolis and Saint Paul, then check out the multi-million dollar homes on the Parade of Homes tour, or the Remodeler Showcase. You will see many of these ideas put to use, as well as some over the top ones which can only be thought up by a home owner who really wants to see his fantasy come to life. What Are the New Color Trends in Luxury Living?